We need to ask ourselves what these tales in political corruption are teaching us to believe. It took me a whole weekend, but fueled by Utz cheese balls I got through the entire run of House of Cards. That foreshadowing you’re detecting is exactly correct: I found it a slog. I think Emily Nussbaum at The New Yorker was very right when she wrote in this week’s issue that it’s “elegant,” in terms of script and production value, and fairly aggressive in its message that it is a realistic sort of fiction we are watching. But “it’s a meditation on amorality that tells us mostly what we already know.” What we already know, in that rubric, is that politicians are corrupt, that power-brokering and negotiation are dirty businesses. 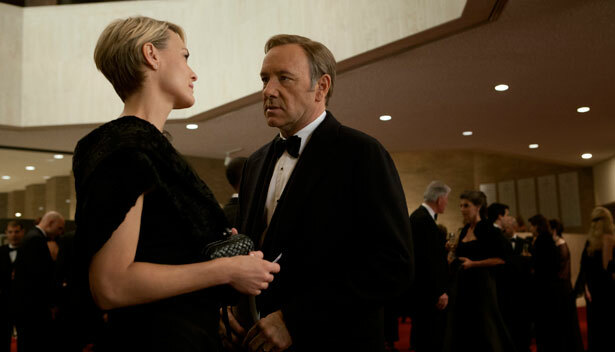 Kevin Spacey’s Congressman, Francis Underwood, spends much of his time reminding the naifs in his orbit of that. Not that there’s much innocence to go around in this crew: his wife (Robin Wright) is prepared to screw him over, the young reporter (Kate Mara) tells him pretty explicitly that she’s prepared to play his “whore.” The closest thing this show has to an idealist is the girlfriend of a drug-addicted senator who helps him cover it up, which in the rosiest view she does because she believes he’s one of the good ones. But even there, she barely peeps up when he sits silent at a committee meeting leading to a shipyard's closing that costs his district thousands of jobs. This über-cynicism turns up in popular culture a lot. The trope of the corrupt political process is the plot engine of shows like Veep and even Scandal, as Nussbaum pointed out. (Homeland fits in here, too.) It also makes cameos in a number of other shows whenever they hit up Washington. It’s not necessary to be a naif here to notice, even accepting the obvious distance between fiction and reality, that this worldview matches up pretty closely to public opinion about the powers and pitfalls of government. For all the pomp and circumstance in America about the greatness of the Capitol, the high-flown rhetoric of State of the Union speeches, few people believe any more in government as a setting where political ideals are properly debated. Even back in 2008, the biggest dreamers in the Obama campaign positioned him as someone who would break up the bonds of corruption and dysfunction in politics. And in a way, the massive disenchantment among liberals that set in sometime about midnight on January 21, 2009, is only evidence that all along, the fear was lurking that this was not the panacea they’d hoped for. There are, of course, other views. In popular culture, Aaron Sorkin’s entire existence is predicated on a high-minded, if also entirely self-aggrandizing, idea that somewhere out there there are men (and the clumsy-but-well-intentioned women who adore them) who are in power to do good. His unlikely comrade-in-arms, I think, is someone like Amy Poehler. Her beloved, if low-rated, Parks and Recreation stars her as a sort of mid-level functionary determined to make some small difference. Irony was draped all over this, at first, for comedic effect, but as the show went on it became hard not to respect her drive. And yet: these are the views that are typically attacked as liberal fantasizing, naïve and unknowing of true “human” nature, in a way that the other shows are not. Both present heightened versions of reality, but only one skews that way, in a lot of public reaction. The idea that power corrupts, etc., has a powerful hold everywhere in the “real” world, of course. And yet, speaking as a Canadian expat, it’s always seemed to me to be much more concentrated in America. At least in terms of the baseline up North, it isn’t presumed immediately that “government,” as a category, can’t achieve anything. Or at least it isn’t presumed that the private sector automatically does things more efficiently or even just “better,” whatever that means. This explains, for example, why although there has been a Conservative government in Canada for years now, one that could rival your average Republican for pig-headed thinking, they have never been able to dismantle the public healthcare system. In spite of the ominous coverage it receives down here, that system is hugely popular, at the very least generally agreed by Canadians to be much preferable to the American hell of private red tape (yes!) and expensiveness. These pop culture artifacts are of course only articulations of one of the great myths of American culture: that the problems in its politics are fundamentally about individual morality. Much as I enjoyed Lincoln, there is something of an anointment of secular sainthood to the hullabaloo surrounding it which comes off as the other side of the corruption coin. Put it all into the American love of a good show, and government becomes an operation of gods and devils, just like it is on television. As proof you need look no father than the persistent belief that if one ousts the one or two or, you know, 300 bad apples from government—every last one of those Francis Underwoods—we would be left with a system that is largely workable. And that is, as people from James Fallows to Lawrence Lessig to Ezra Klein would put it, balderdash. They all explain why it is in slightly different ways—all of course pointing to the money/lobbyist problem, though there are a lot of vague and undefined references to “partisanism” too—but they agree that the system is as broken as some of the people in it. No one is denying that dramatizing a broken system is a lot harder than dramatizing a broken person. And I am not, of course, suggesting that the pessimism of Americans can or should be solved by popular culture alone, nor even that popular culture has any obligation to solve it, though perhaps Sorkin might agree with that. He would be well reminded that his attempts to instruct the media on how it should operate, with The Newsroom, have not gone down all that well. Didacticism is a tricky tactic for an artist. But that doesn’t mean we shouldn’t ask ourselves what lessons things like House of Cards, with its aggressive devotion to “realism,” are teaching us, anyway. misbegotten, fallen-hero-centered morality tale, Dave Zirin writes.